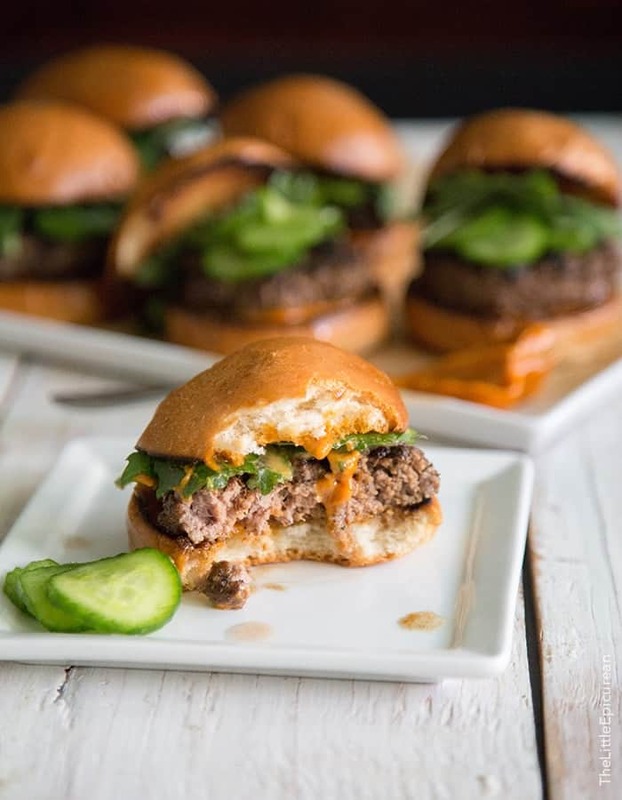 These Asian Sliders are seasoned with a sweet glaze, topped with gochujang mayo and crunchy quick pickles, and served on mini brioche buns. When I was younger I was obsessed with love and fairy tales. I’d constantly ask my mom how she knew my dad was the one. 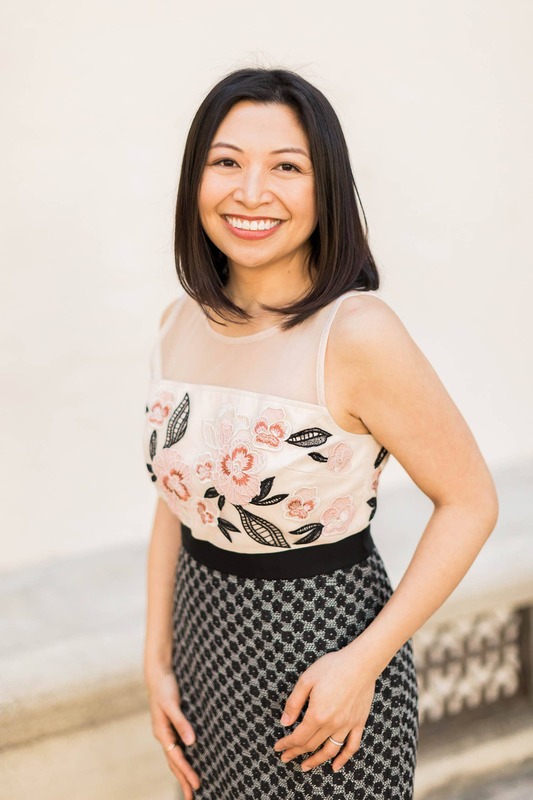 She’d always have the same answer talking about love and mutual understandings and common interests, but the one thing that stuck with me was her story about burgers. She had mentioned that when she’d go out on dates, she would only order salads, pastas and any dishes that were easy to eat with a fork. Even though she loved burgers, messy sandwiches, and pizza, she refused to order it on first dates. She made it a point to eat foods that were dainty and lady-like. She broke all the rules when she and my dad had their first dinner together. She ordered a big, juicy, delicious burger that required two hands to eat and a whole lot of napkins. My mom explained that from the first time she met my dad, she felt super comfortable and at ease with him. She says my dad was the one because she didn’t feel self-conscious eating messy foods around him. To which I responded, why didn’t you just order cute little sliders? She brushed off my comments and continued on with her story. It’s a little difficult for me to relate because I’ll eat a burger in front of anyone. Come to think of it, I can’t date someone unless they love In-n-Out Burger. Not liking burgers is a major red flag and grounds for dismissal. To me, it’s love when the guy is more than willing to give me the one curly fry that magically ends up in a batch of regular fries. Now, that’s LOVE. That’s when he’s the ultimate keeper. So in honor of my parents’ love story- I present you with the first burgers EVER on my blog! Since I’m a fan of anything mini and cute, I made sliders! 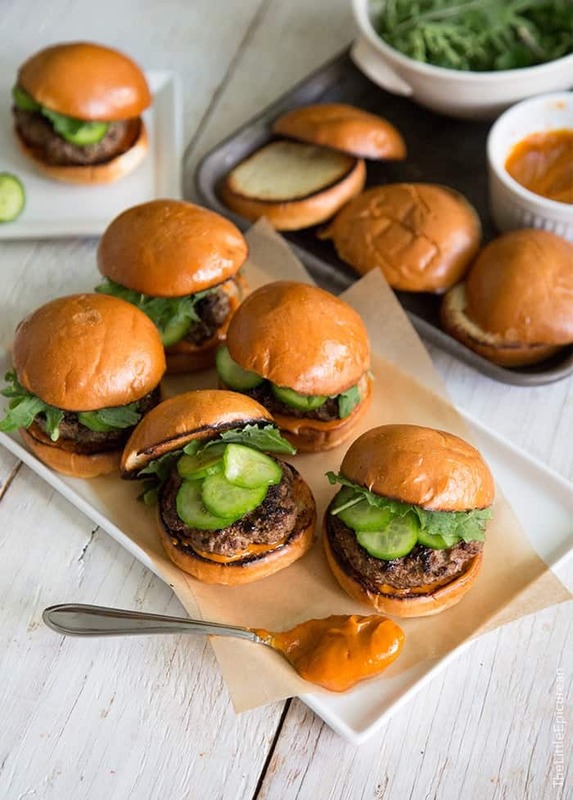 And not just any old plain slider, these are my Asian sliders with gochujang mayo and crunchy quick pickles! My love for burgers knows no end. If you check out my travels section, it’s pretty obvious I can’t visit a city without trying a burgers. See my eats in Kauai, Las Vegas, Austin, and Portland. One of my family’s favorite burgers comes from Bachi Burger in Las Vegas. What makes Bachi Burger so special and tasty- is the way they cook their burgers. As the burger patty cooks, they baste it with a sweet glaze that give it a nice crust, as well flavors that you would normally associate with Asian bbq (think Filipino bbq skewers and Korean bulgogi). I used that same technique to flavor these Asian sliders. Rather than using boring mayo, I amped up some spice by adding gochujang, Korean hot pepper paste. Gochujang is the new sriracha. Give it some time and I guarantee it’ll be everrrrywhere! I would love to make brioche slider buns from scratch, but who has time for that?! Instead, I use mini buns from La Jolla Baking Co., which you can find at Costco. Every burger requires a pickle. I love these crunchy quick pickles. They only take 10 minutes to make. They’re not sour like traditional pickles. These quick pickles are bright and fresh tasting. All you need is sugar and salt. That’s it. I can’t describe how delicious these Asian sliders are. But I can tell you that I had to really restraint myself from gobbling these down in one bite. Getting this photograph of a half eaten slider was torture. It’s a good thing, the Super Bowl is this Sunday! I have reason to make these Asian sliders again! 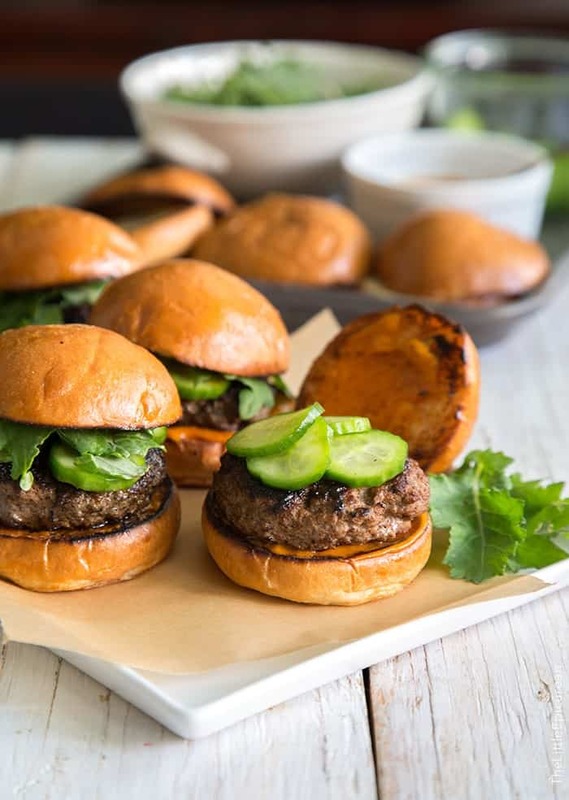 These Asian Sliders are seasoned with a sweet glaze reminiscent of Asian barbecues. 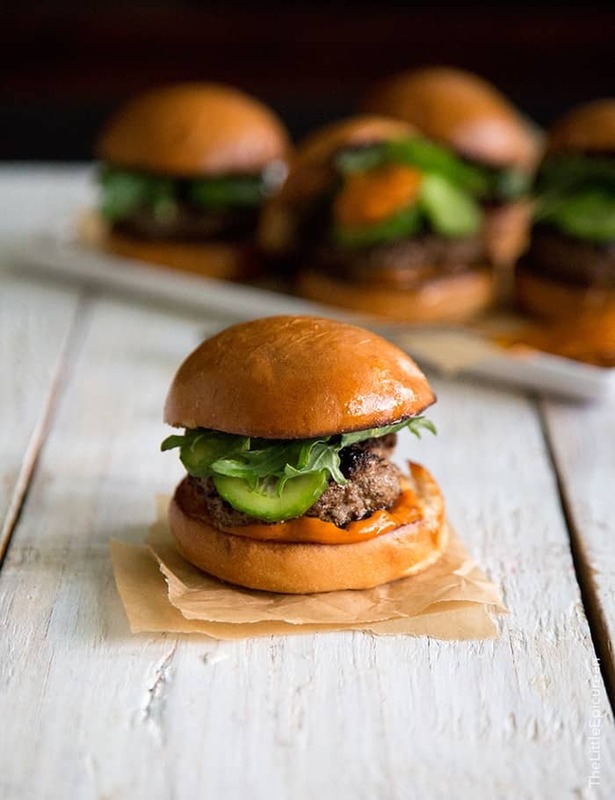 It's topped with crunchy quick pickles and spicy gochujang mayo and served on mini brioche buns. It's the perfect game day snack! Mix together ground beef, salt and pepper. Set aside. 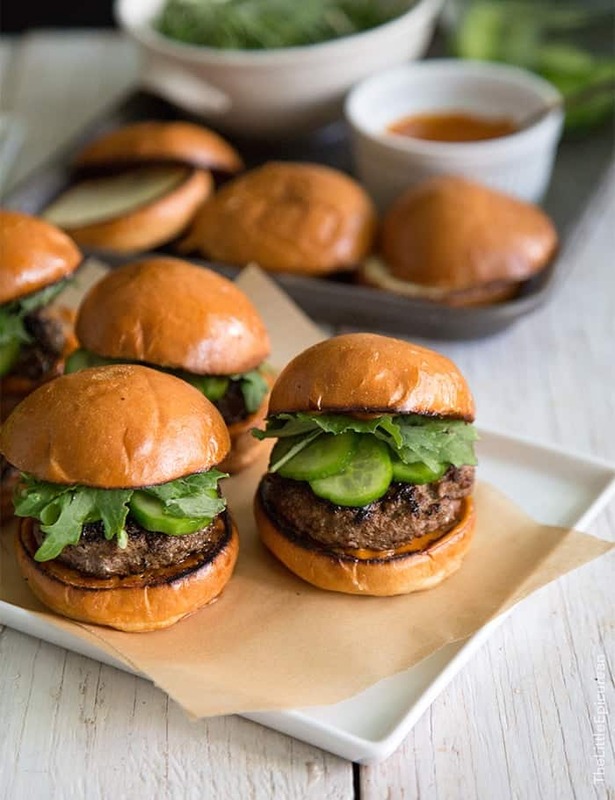 To make burger glaze: combine hoisin sauce, soy sauce, sugar, rice vinegar, garlic and ginger. Stir together and let sit for 10-15 minutes. Add patties to hot pan and press down with a flat spatula. Let cook for about 1 minute until crust has formed. Brush top with glaze. Flip patty and brush other side with glaze. Cook for another minute, flip, and brush again. Do not overcrowd the burgers. Work in batches, if necessary. Once burger is cooked, remove from skillet and transfer to plate and allow to cool slightly. Heat a clean skillet over medium heat. Brush buns with oil. Lightly toast buns on hot pan. 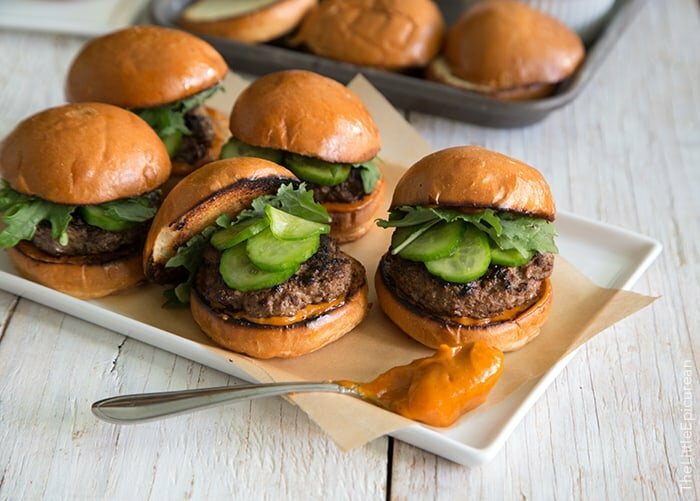 Spread gochujang mayo on buns, top with burger patty, quick pickles and greens of choice. Serve and enjoy immediately. In a small bowl, mix together mayo and red pepper paste until smooth. Toss sliced cucumbers in sugar and salt. Let sit for 5 minutes. Rinse pickles under cool water. Drain. Taste and season with salt as needed. (I added a rounded 1/4 tsp of kosher salt.) Chill in the fridge for 5-10 minutes, while you cook the burgers. Then use immediately. Gochujang is available at Asian markets, Whole Foods, and Amazon.com. I found this brand at my local Ralphs. These burgers were delicious and adorable! The gochujang mayo was my favorite part; looking forward to using the leftover mayo as a spread for…well, everything. These are darling and sound so delicious. I know my hubby would approve of the gochujang mayo! Thanks! Yes! It’s just the right amount of spice. My boyfriend can’t get enough of the gochujang mayo! I know this is sacreligious but could this be made with ground turkey? Love the story and recipes! I love your story!!!! Now I have to go buy the ingredients. Can’t wait to make these! Exactly my kind of burger!I can’t wait to try them very soon I hope!A zillion of thanks! 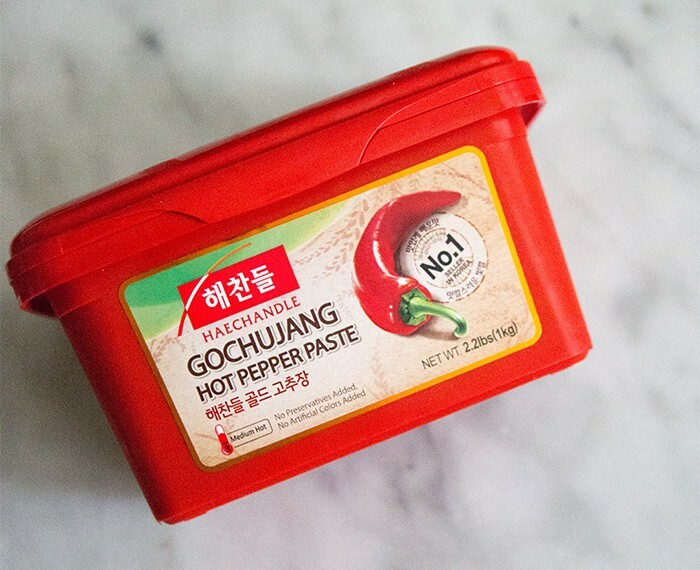 Is gochujang sweet at all? Or is it just spicy? Gochujang is a good balance of sweet and spice. It’s definitely more sweet than salty.